What they offer: Topsy seems like Google for social media. You can search for a particular keyword and it will tell you who the most influential people are that use the keyword. There are several options that allow you to search all social media, just Twitter, or even to see trending terms and experts in certain fields. Getting Started: Once you go to http://topsy.com/ you can start searching right away, no registration required. Start typing in a keyword and it will offer suggestions of the most used words. You can also search links, tweets, photos and videos. Favorite Feature: I like that you can follow, reply or retweet directly from the search results. This allows you to keep track of the most influential users in the fields that you are interested in. Overall: I am glad that I stumbled across this site. Since I am just getting started with really utilizing social media for my business, I think this will be a valuable tool to analyze what other people are doing to be influential in social media within the areas that I am interested in. 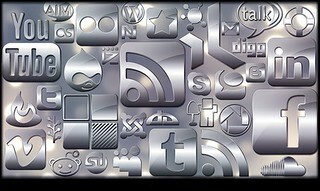 What social media tools are your favorites right now? What are your favorite tips and tricks for building your social media base? Let me know in the comments, and make sure you subscribe for tomorrows blog straight to your inbox. Thank you to webtreats for the photo above. I have always maintained a MySpace or Facebook profile because I felt obligated to ‘go along with the crowd’, but it wasn’t until recently that I decided I really needed to start taking advantage of the different social media outlets and all of the great tools that are available. Between trying to blog everyday and start up our webdesign business it is important to be as active in these communities as possible. My goal is to start using and learning one new social media tool each week, and hopefully I will be able to use them to develop this blog, and my business. The first tool I started learning about today is Hootsuite. I have been hearing about it for a while, but had been resistant to start using it. What they offer: Hootsuite has three different plans, their basic free plan, a pro plan for $9.99 and an Enterprise plan which you have to request a demo of and is for much larger companies. Obviously, I don’t have the need (yet) for the pro version, so I decided to learn about the Basic Package. This package includes, HootSuite Conversations, 5 social profiles, quick reports, message scheduling, unlimited apps and 2 RSS/Atom feeds. Which accounts you can use it with: You can add 5 profiles from your Twitter, Facebook, Google+, LinkedIn, foursquare, WordPress, MySpace, or mixi accounts. Getting Started: I just started by linking my Twitter and Facebook profiles, which was really easy. The interface is really simple; each profile gets its own tab which is laid out in columns, with recent posts, tweets, statuses, etc. On the Twitter tab you can easily see any mentions of you which makes it easy to monitor the effectiveness if you are using Twitter is a marketing tool. Favorite Feature: The main reason I had kept hearing about HootSuite, is because you can use it to schedule posts to happen at a specific time, and you can also schedule in bulk if you are a Pro member. You can access the bulk schedule feature from the toolbar on the left hand side, within Publisher (the icon looks like a paper airplane). To schedule a regular post you just start typing in the post bar at the top of the post. Once you have typed your message click the calendar icon and you can set the time and date for your Tweet/Facebook post etc. to go out. You can also set up auto scheduling to optimize the impact of your message. Overall: I definitely think I will continue to use HootSuite to manage my social media profiles. I like the ease of use, and I have always thought how nice it would be to schedule my posts to go out at a better time. I definitely recommend checking it out if you have been resistant to social media tools in the past, it’s a good starting point. What social media tools do you use and love? There are hundreds of articles about the ‘best’ tools, but it makes it hard to figure out which ones are the best, and which overlap others. Let me know which one I should try out next Saturday! Also make sure you follow 365 new things on Facebook and Twitter so you can check out my progress.